Manage a website without technical knowledge. Editors with a high "Word processor look and feel" rate. Pupils/teachers can have personal pages on the website. Teachers can check pupil pages before publication. E-mail alerts can be sent to admins when pages are updated/created. Extensive number of available modules. Possible to create your own template. Site@School is a standard option in ServerAtSchool and chances are that it was installed as part of your ServerAtSchool installation. The Exemplum Primary School uses the Site@School website content management system to manage and maintain its website. The world at large can see the website at http://www.praeceptor.exemplum.serveratschool.net as illustrated below. When you want to see the website from within the school, i.e. from a workstation connected to the local area network (LAN), you can also use the shorter URL http://server/ to see the website. Website maintenance can be done by logging on to the CMS. The logon dialogue can be found at http://www.praeceptor.exemplum.serveratschool.net/starnet as illustrated below. When you want to logon to the CMS from a workstation connected to the LAN, you can also use the shorter URL http://server/starnet. You need a valid combination of a username and a password to enter the CMS. In the illustration above the username 'webmaster' and the corresponding password were already entered into the dialogue. Note that the password is displayed as a string of asterisks. This is a security measure. Site@School is a well-documented project. Please take some time to study the documentation. 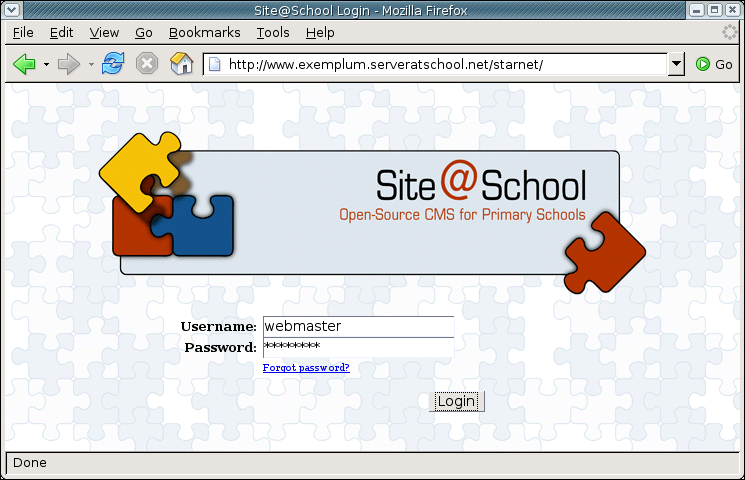 If the documentation is installed on the server, it can be found at http://www.exemplum.serveratschool.net/starnet/manual/ or at http://server/starnet/manual/ from a workstation within the school. 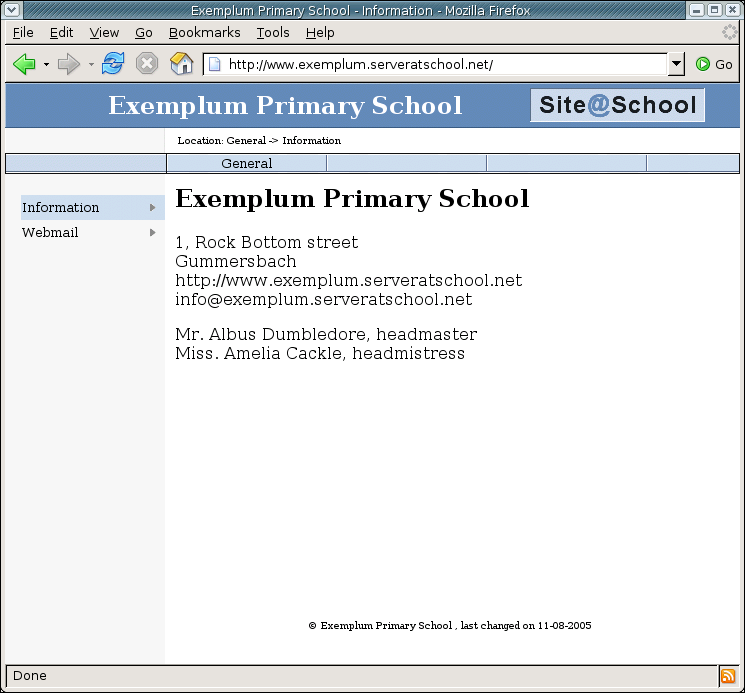 NOTICE: You should replace the part 'www.exemplum.serveratschool.net' with the actual name of your server at school. If you find that the online documentation was not installed on your school's server, you can download it from the project's home page at http://siteatschool.sourceforge.net under 'Downloads'. A good starting point to read is the 'Guided tour'. This is a brief description to get you started easily and quickly. The only thing you need to actually work with the CMS is a valid combination of a username and a password. Please ask your local systems administrator or your ICT coordinator for more information. Site@School has a 'sandbox' that is renewed every 24 hours at 02.00 UTC. The URL is http://wyxs.net/daily. There you can try out things before putting them on the the schools's site. The home page of the Site@School project can be found at http://siteatschool.sourceforge.net. Here you can find information on latest versions, bugfixes, a link to the S@S-forum, available templates, and other goodies. NOTICE: If you want to ask questions on the S@S-forum you should be familiar with 'How To Ask Questions the Smart Way', by Eric Steven Raymond. This enlightening document can be found at: http://www.catb.org/~esr/faqs/smart-questions.html. Do not ask Mr. Raymond any questions. This explicit request is at the beginning of his text. Reading this document before asking questions on which the answers can be found in the manual or in the S@S-forum, greatly relieves the pressure on the Forum's maintainers.